The Bradshaw Foundation and Professor Stephen Oppenheimer have a new theory on the migration of human beings from Africa over 160,000 years. 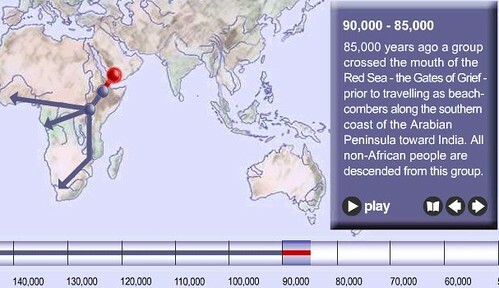 Based on DNA analysis, the conclusion by Oppenheimer is that about 85,000 years ago, humans migrated from Africa to the mouth of the Red Sea. From there they reached India, traveling through Yemen, Oman, Iran and Pakistan. 74,000 years back, there was an eruption of Mt. Toba in Sumatra and the volcanic ash covered India and Pakistan and causing population crash. Following that incident, the Indian peninsula was re-populated. One of the statements by Stephen Oppenheimer is that all non-African people in the world are descended from this group which migrated to India and India was populated much before Europe, Americas and Australia. While Oppenheimer’s study was based on DNA evidence, there is another archaeological study which confirms this theory. University of Cambridge researchers Michael Petraglia and Hannah James by analyzing fossils, artifacts, and genetic data. According to them, a human ancestor Homo heidelbergensis, arrived in India about 250,000 years ago from Africa. Modern humans arrived in India about 70,000 years ago and wiped out the Homo heidelbergensis. The new theory posits that as much as 70,000 years ago, a group of these modern humans migrated east, arriving in India with technology comparable to that developed by Homo heidelbergensis. But modern humans outcompeted the natives, slowly but inexorably driving them to extinction, Petraglia says. “It’s just like the story in Western Europe, where [modern humans] drove Neandertals to extinction,” he says. Like Oppenheimer’s research, Petraglia and James’ research too concludes that modern humans arrived in India tens of thousands of years before their arrival in Europe. So next time someone tries to pull the Aryan Invasion/Migration/Tourist theory on you, ask them, in which direction the migration happened? Ravages, I posted only the first part of this post before, the one based on Oppenheimer’s work. The second part of the post deals with an independent conformation of those dates based on archaeology. I was talking about that one too. But then I realised that the archaeological research was posted to Ind-Arch and that’s where I read it. I am getting my two sources of History confused.